The nitrification process is a 3 step process that converts toxic ammonia to nitrate which is a useful nutrient for the plants. Fish eat protein and excrete waste which consists of ammonia. The less toxic form of ammonia, Ammonium NH4+ is first converted to nitrite by beneficial bacteria called nitrosomonas, subsequently the nitrite is then converted into nitrate by another type of beneficial bacteria called nitrobacter. Let’s look at nitrification with some more details. In aquaculture or aquaponics, feed with high protein content is fed to the fish as an input to the system. Fish consumes the feed and generates waste which consists of Ammonium NH4+. Some of the feed is uneaten by the fish and remains in the system as an additional source of ammonia as it breakdown overtime, therefore it is important not to overfeed the fish. Ammonium, as a first step gets converted into nitrites by beneficial bacteria using oxygen as an energy source. There are several species of bacteria that convert ammonium to nitrites however the predominant species is called nitrosomonas. As ammonium combines with oxygen during the metabolic digestion of the bacteria H+ ions are released into the water gradually lowers the pH of the system, therefore the conversion of ammonium to nitrites is an acid forming reaction. 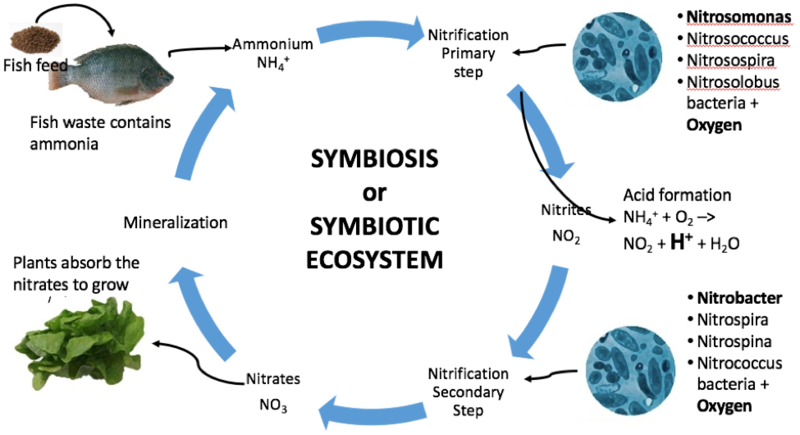 During the second stage of the nitrification process nitrite is converted into nitrate by another type of beneficial bacteria, mainly nitrobacter, present in the system. Nitrates are then absorbed by the plants directly from the water as they continue growing. In a well established system the nitrifying bacteria convert most of the ammonia into nitrates highly efficiently where the nitrites levels are low enough at all times to pose no risk of toxicity to the fish. Denitrification, on the other hand, is another crucial chemical process that can potentially alter the water chemistry significantly and affect both your plants and fish. 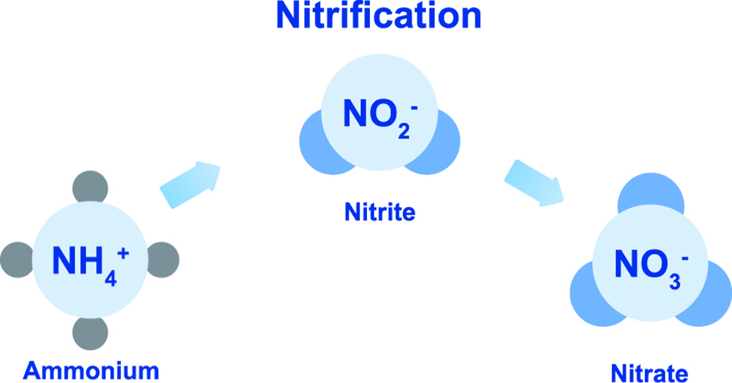 Denitrification is the conversion of nitrates (NO3) to inert nitrogen gas (N2) as it final product, it is the reverse order of chemical reactions that occur in nitrification. It’s the final step in the nitrogen cycle, a combination of natural processes by which nitrogen transforms from one form into another. Denitrification is mainly conducted by hetrotrophic bacteria that are different than the ones responsible for nitrification. Denitrification can occur unintentionally, as solids accumulate in the system and oxygen levels in the water drop it creates an ideal habitat for the denitrifying anaerobic bacteria to thrive. Denitrification can cause nitrates to convert back into toxic nitrite. Therefore, it is important to keep optimal oxygen levels in your system at all times, making sure the filtration system is working properly and solids accumulation is at a minimum. Other factors that control denitrification are pH, Temperature and salinity. In some cases, where the system is designed for greater fish biomass and higher feeding rates, denitrification can be used to remove excess nitrogen that can build up with solids accumulation and be harmful for the fish. Denitrification tanks are commonly used in aquaculture; however, they are less likely to be used in aquaponics, unless the system is design to be more intensive on the fish production than the production of crops. In the UVI system a denitrification tank is integrated in the design to collect solids using bird netting and anaerobically converting the excess nitrates into inert nitrogen gas. It is useful to note, that High nitrate levels reduce the setting of fruiting plants such as tomatoes and cucumbers and stimulate leafy green plants. So, depending on the type of crops grown and the amount of fish and feeding rate of the system, denitrification may become an important addition to the system design. Looking for more in-depth resource on other topics of aquaponics? check out the Fundamentals of Aquaponics a Guide Book. Alvarez, L., Bricio, C., Blesa, A., Hidalgo, A. and Berenguer, J. (2014) ‘Transferable Denitrification capability of Thermus thermophilus’, . doi: 10.1128/AEM.02594-13.